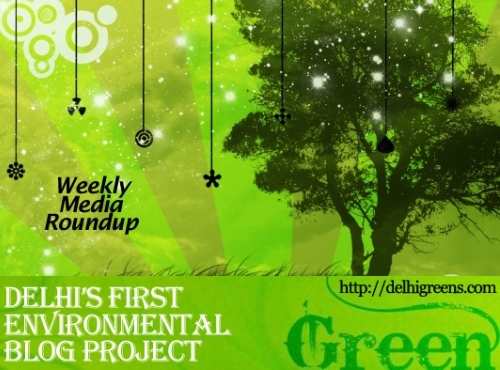 Weekly green news update from across different media networks for week 35 (between August 29 to September 4) 2016. The Art of Living Foundation has requested the National Green Tribunal an extension of date for submitting their response to the tribunal-appointed committee’s report, which said that the Yamuna floodplain was “completely destroyed” because of the three-day World Culture Festival in March. The New Delhi Municipal Council not only met its target of planting 2 lakh trees but surpassed it by planting as many as 5 lakh saplings this monsoon, said officials. To make the sanitation facilities accessible to maximum number of people in south Delhi and discourage them from defecating in open, the South Delhi Municipal Corporation plans to install mobile toilets, multi-purpose dustbins and green waste shredders at public places in large numbers. The Delhi High Court on Wednesday took suo motu cognizance of a matter regarding misuse of the carcass utilisation and rendering plant in Ghazipur. Heavy rain in Delhi-NCR this monsoon may have spelt chaos for residents, but it has brought rare joy to birdwatchers as a large flock of the black-headed ibis, a threatened species, has flown to Surajpur Wetland of Greater Noida for breeding. Five to six civilian dump trucks have been parked for the last two weeks in Panchwati Colony Delhi Cantt near 13 BRD IAF office. Irked over the menace of unauthorised industrial units running in residential areas in New Delhi, the National Green Tribunal has directed the Centre and Delhi Government to close all of them in an East Delhi locality with immediate effect. The National Green Tribunal has taken exception to non-submission of status report on quality of water supplied to households in the national capital by the Delhi government despite repeated directions. State-run power giant NTPC today said it plans to plant one crore trees across the country this fiscal under its afforestation drive. Disquieted by the failure of civic agencies to clear the drains, leading to waterlogging on city roads, the Delhi High Court on Thursday said the agencies were engaged only in passing the buck. India must opt for a fuel that is carbon free to reduce its Green House Gas emissions, said Jonathan Pershing, special envoy for Climate Change, US department of state.